Finally, 8:52 rolled around, probably closer to 9:00, and I was off. Within the first 200 meters of the pool swim, I passed 3 swimmers. The first 200 meters are narrow, with swimmers going down and back in the same lane, this made passing difficult. After this 200 meter section, there was a whole lane for each direction and passing wasn’t an issue. I ended up with a 9:34 swim, a 45” improvement over 2004. Transition two went smoothly and surprisingly my calf didn’t feel all that bad, it felt tons better than the day before when I had limped for half a mile after the bike. I didn’t feel like I was moving very fast, but I was passing a lot of people. A bunch of athletes coming in the opposite direction were calling out my name, seeing that it was written across my chest, this was giving me a little extra incentive. My fear had been that I would have to walk on the run, however things didn’t feel too bad and before I knew it the run was done. 30:20, a 6:19 pace, much better than I expected, especially since I had run at 6:36 pace the year before! My final placing was 4th overall with a time of 1:33:33, 2:11 faster than in 2004. The three of us met early on Saturday morning and headed down to Memphis. We arrived at race site around one in the afternoon and picked up our packets. After a brief dip in the lake, Greg and I headed out to bike the run course, while Miki proceeded to swim the full 1.5k swim, oh to be a former collegiate swimmer… Not only am I not a great swimmer, I was also experiencing shoulder pain during my brief swim that afternoon, enough pain I wasn’t sure I could make the swim the following morning. Once out on the bike I settled into a rhythm and tried not to think about the swim. While I felt like I could go faster on the bike, I decided a controlled effort would be better as I would still have something left for the run. After several miles, I caught and passed Steve Taylor which was a shock to me. For one reason, he had started several minutes behind me, so he had apparently passed me in the water. But even more so, I was shocked at the fact that I had caught him at all since he is such a strong biker, apparently he was having a bad day on the bike or I was having a really good day, probably a combination of both. My goal on the bike was to go under an hour, hopefully around fifty-five minutes. 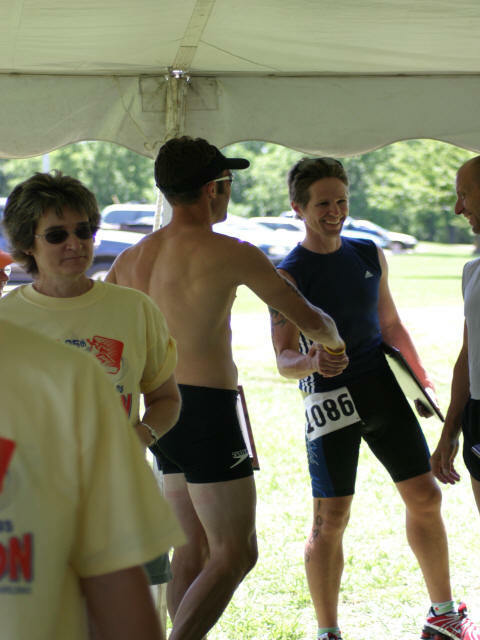 I ended up at fifty-nine minutes and ten seconds, my first triathlon averaging over twenty-four miles an hour. I went under an hour, but not quite as fast as I had hoped. In the last major corner just before the end of the bike I swung the corner a little too wide. I stayed on the road, but in doing so my left calf muscle cramped up really bad! The last couple of minutes on the bike were spent trying to work the cramp out. Pulling into the transition I really concentrated on getting out of there with a really fast transition. I ended up with the second fastest transition in my age group. As usual, after the bike, the run took a while to get in a rhythm. My first mile split was 6:40, not terrible but slower than I expected. At the second mile split I had slowed to 6:41, however this included several difficult hills so I actually felt good about this split. Also, I was starting to feel comfortable and had passed several guys in my age group who had started after me; I was making up for time I had lost in the swim or on the bike. I missed hitting my split button on the next mile marker, but at mile four I had 12:55 for two miles so my pace was down to around 6:27. Mile 5 was 6:34 and mile 6 was 6:20 with a final run time of 40:36 a 6:32 average pace. My total time was 2:10:28, an improvement by 9:10 over my time in 2003. I was 11th out of 138 in my age group. Once again, my swim was the deciding factor. The swim times of the guys in front of me on average were around 5 minutes faster. One more reason to keep working on that swim!